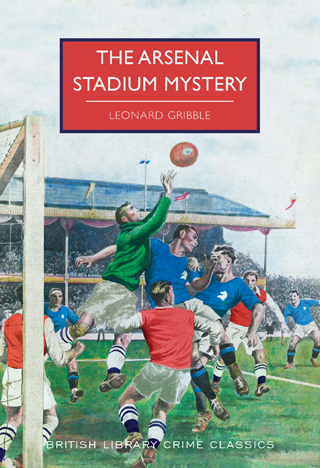 The Arsenal Stadium Mystery by Leonard Gribble – Book Review. Crime reissue. Published in 1939, author Leonard Gribble managed to combine his fiction with the real-life ’39 Arsenal squad in a highly competent, if perhaps occasionally dry murder mystery. Amateur club the Trojans face Arsenal in what is presumably some form of play-off – the author does not elaborate – but murder takes place on the field, not long into the first half. Author Gribble describes the match well, and the immediate post-murder scene is penned in a wonderfully descriptive manner. Luckily for the Arsenal team they are portrayed well, as is the amateur Trojan team, but with murder afoot the need for a quick resolution taxes Inspector Anthony Slade, who along with Sergeant Clinton spend much time driving from Central London to Northern and Southern suburbs, and further away too. Gribble, who in 1953 was a founder member of the Crime Writer’s Association, does a good job in creating both pleasant and nasty characters – Slade is a model of restraint and understanding but the reader gets the feeling there is a cruel (or perhaps hardened) streak not too far below the surface, while Clinton is the dour, doubting sidekick who gets through the day aided by more than a touch of cynicism. With patience taxed by plenty of possible-suspect obfuscating, Slade and Clinton have their work cut out to cut through the flak thrown at them from members of the Trojans and Gribble does a good job of weaving plenty of twists and turns in the final third or so of the book – enough to make the reader think they’ve found the suspect when in fact they are well off course. A good read in many respects, perhaps lacking the character portraits and black humour of other titles, but still a thoroughly engaging read.